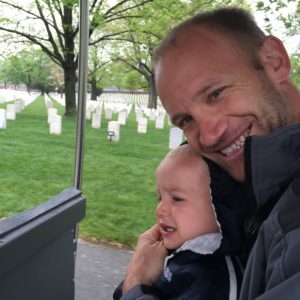 What does Memorial Day mean to Americans? What began as Decoration day, Memorial Day originated as a day of remembrance of those who have died while serving our country. To many it marks the beginning of summer, decorating graves, and getting together with family and friends. I can’t think of a better way to celebrate the lives of those who have gone before us, than by spending time with those you love. My husband and I visited Washington, D.C. this past spring. One of my favorite places that I loved visiting was Arlington cemetery. Traditionally, every year on Memorial Day, the President of the United States visits Arlington Cemetery and participates in a wreath laying ceremony. On the day my husband and I visited, it was a bit chilly and had started to rain. We first got on the shuttle that takes you to different parts of the cemetery. The tour guide began telling us the history of the cemetery and then began telling us of the many different people who were buried there. I sat thinking about all the lives lost and families affected by their losses and began asking myself……. Who were these men and women? I was truly touched. There was a sense of sacredness in the cemetery coming from the endless rows of headstones. White headstones that decorated the rolling hills, reaching as far as you can see. Servicemen who sacrificed their lives, so that my family can live in this wonderful place. Truly a sight I will never forget. Our first stop we made was to the Tomb of the Unknown Soldier. I was not expecting the myriad of feelings I felt. I cried, I smiled and was incredibly grateful for these men and women. I didn’t want to leave. 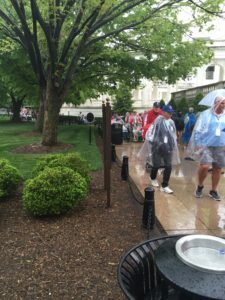 It was pouring rain, and I was freezing, but the feelings I had there were of wonder and respect. We stayed for the changing of the guards and a couple wreath laying ceremonies. The rain created a sense of melancholy that intensified the experience for me. We were cold and drenched from head to toe. 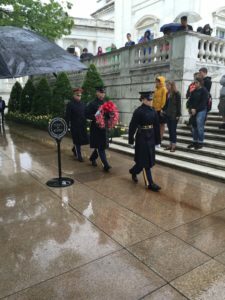 We learned that The Tomb of the Unknown Soldier is guarded 24/7 regardless of the weather. These tomb guards go through intense training and only a handful make it through that training. It is considered a high honor to be a tomb guard. (This site gives great info on the changing of the guard). As we were leaving I turned to see a line of people being pushed up the path in wheelchairs. My heart stopped when I noticed that each of these men in wheelchairs were veterans. They each wore a rain poncho and most wore a hat signifying the war they fought in. 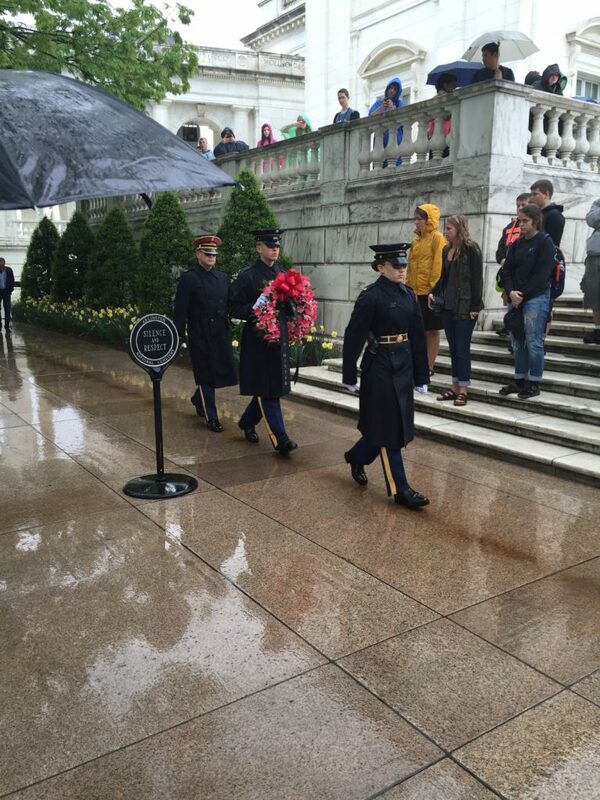 These amazing men who many couldn’t walk came to pay respect to the Unknown Soldiers in the pouring freezing rain. They carried with them years of experience and wisdom. I wanted to hug each one of them. I was truly touched. May we all take a few minutes to remember those who died, and be ever so grateful for the freedoms we have because of these great men! I recorded the changing of the guards while we sat there in the pouring rain. Take the few minutes and watch it. If you have never witnessed it, it is a great experience.